Though a Spirit of '76 caboose is listed and pictured, Bachmann also provides a listing for a Bicentennail Caboose in the 1976 catalog. This version is decorated in the Norfolk & Western Bicentennial scheme found on the U33B and Wide-Vision Caboose models, though the lettering does not include N&W's name. Bachmann's 36' Steel Off-Center Cupola Caboose is among the first group of HO-scale rolling stock offerings in the company's 1970 product catalog. 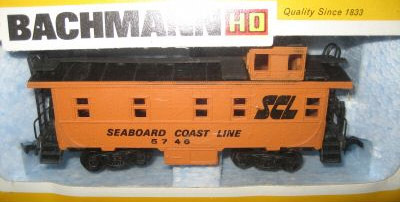 The Bachmann Caboose offerings begin with six roadnames in 1970: Burlington, Great Northern, Penn Central, Pennsylvania, Santa Fe, and Union Pacific. For 1972, Bachmann adds Burlington Northern and CP Rail to the roster of Caboose offerings. Bachmann's Caboose is presented with five new roadnames in the 1976 catalog: Bicentennial, Canadian National, N&W, SCL, and Spirit of '76. The Caboose retails for $3.50 in 1976.